The purpose of Pinterest varies by brand, but the end goal is usually the same: engage with online users to increase brand recognition and drive sales. Brands are becoming more savvy with the way they use Pinterest to meet this goal. One of the latest ways brands are incorporating Pinterest into their marketing plans is by making it their online catalog. A great example of a brand doing this is REI. REI is a heavy user of Pinterest. They have nearly 13,000 followers, over fifty boards, and nearly 2,000 pins. Many of their boards are specific to various outdoor activities and sports, such as rock climbing, yoga, backpacking, and swimming. However, REI has also created specific gift boards, such as “Father’s Day Gift Ideas” and “Things we Want for the Holidays”. These boards closely resemble traditional catalogs, providing snippets of their product offering. 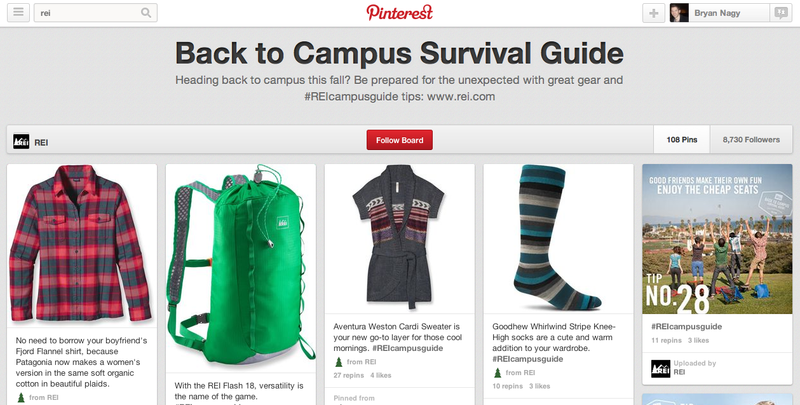 REI’s latest board, “Back to Campus Survival Guide”, is an even better example of a catalog on Pinterest. The board not only offers a range of products great for students heading off to college, but it adds in tips for surviving college. One example is “Good friends make their own fun. Enjoy the cheap seats.” Included with this tip is a photograph of college students enjoying themselves out at a sporting event on the lawn. These college tips are exactly what you’d find in a print version of an REI catalog. Product catalogs typically have additional content aside from selling, such as photographs of models, stories of the product, an interview with real customers, etc. The impact of Pinterest is substantial. Now, not only are catalogs static, they can be updated frequently and products can be promoted throughout a time period depending on when the brand pins each product. It’s no longer just a book of products. It’s a living page seen not only on REI’s profile, but within the home feed of followers and engagers. The end result is more interaction and exposure to customers.